Dunyvaig Castle on Islay where a dig unearthed a clan seal, dating back to 1593. A rare Scottish clan seal dating back to the 16th century and seen as evidence of a turbulent and bloody history has been discovered by a student on Islay. The artefact was found during a three-week excavation at Dunyvaig Castle and is the seal of Sir John Campbell of Cawdor, one of the most important figures of his generation. It bears the arms of the clan, with a stag’s head and a galley on one side, and is inscribed with the words ‘Ioannis Campbell De Cawdor’. The seal is dated 1593 on the other side. The discovery was made by Reading University undergraduate, Zoe Wiacek, one of a team of 40 archaeologists, scientists and other students who have been working at the site as part of an annual dig. She traced the seal under the rubble of a collapsed stone wall and, realising its significance, passed it on to Dr Darko Maricevic, the director of the excavation at Dunyvaig, who has investigated the often turbulent rivalry between the Campbells and the MacDonalds. Miss Wiacek said: “I removed a piece of rubble and it was just sitting there. I called over my supervisor and when it was lifted the soil fell away to show the inscription. Mr Maricevic said: “This is a remarkable find. “Not only is it a beautiful and well-preserved object, but it comes from the floor of a building that we can now confidently date back to the Campbell occupation of the castle. 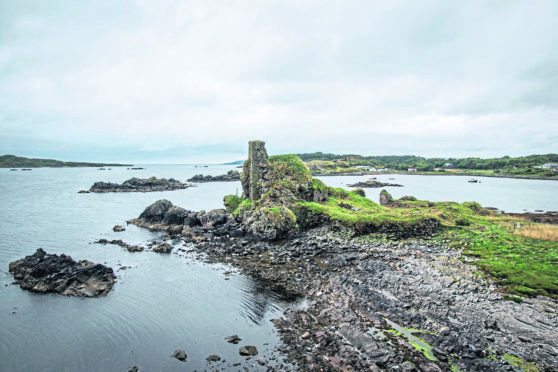 Originally built in the 13th century, little remains of the original Dunyvaig Castle structure. What is left is the 16th century building created by the Clan MacDonald of Dunnyveg. Following a series of battles and skirmishes, Sir John Campbell of Cawdor took possession of the castle in 1615 and that helps explain why the discovery of the seal has sparked such interest among experts. Roddy Regan, an archaeologist at Kilmartin Museum in Lochgilphead, added: “Seals are extremely rare finds. Islay Heritage is hoping to continue to explore the history of the site over the next five years.